Are you planning on surprising somebody? Order a delivery directly to the person you want to surprise (you can enter a different than yours delivery address) in a gift wrap. A gift box is delivered in an ordinary carton box in order to prevent it from damage and contamination. The gift box has the following dimensions 34 x 30 x 12,5 cm. Most clothing items can fit into the box (with the exception of Samshield helmets!) and medium-sized equestrian accessories. Remember that if you order many products, we will be able to put only some of them in the gift box. 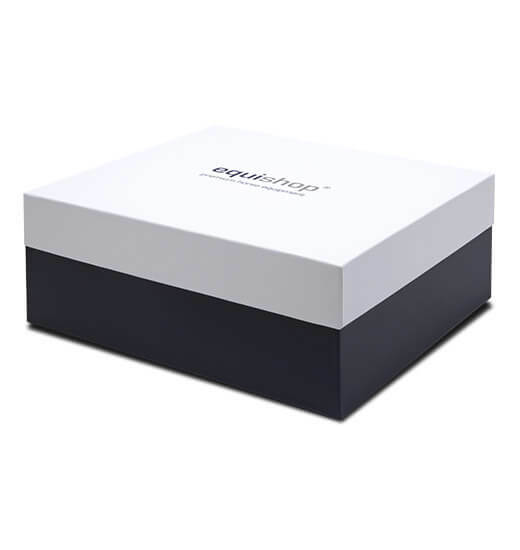 If none of the ordered by you products would fit into the elegant gift box with Equishop's logo - we will pack your order in a substitute elegant wrap. If you have any questions feel free to contact our staff: Call us: +48 32 782 45 68 (press 7 when connected) or write us an e-mail: contact@equishop.com. We also reserve the right to pack high-volume products such as down rugs or saddle pads in our company Equishop bags and decorated with an elegant ribbon. Saddles are also packed in Prestige Italia's brand cases. How to add this service to your order? Just click "add" button in the first step of your cart as it is showed below. Check our video with example below.